"No crib for a bed..."
The simplicity of this construction worked well for me...I had Christmas cookie orders to deal with for the first time, and I had the stomach flu the weekend before Christmas. Thank goodness it was short-lived! I have loved looking at the other amazing gingerbread creations! Everyone did such a great job! What is Christmas without gingerbread, right? THANKS so much to Y and Anna for a wonderful December challenge!!! Hi Sue - thank you for the comment, yours looks so cute too! I will be sure to come back and check your blog after the next DB challenge! Beautiful...simple yet so cute! thank GOD! your stomach flu didnt last long...hope i get over my flu soon!..yah the kids were great! thanks for the comments and dropping by. Absolutely beautiful! Love your idea to make a manger! i love your manger! i thought about making a nativity but i thought that it might be hard to implement it well. you definitely did though. it's beautiful. hope that you had a wonderful christmas! I love your humble little manager. So perfect for the season! Great idea! How sweet! I just love that you chose a manger. I hope you had a great Christmas! I absolutely love your interpretation of the gingerbread challenge. What a beautifully simple stable and manger scene it turned out to be. Oh Sue, I absolutely LOVE this gingerbread manger!! 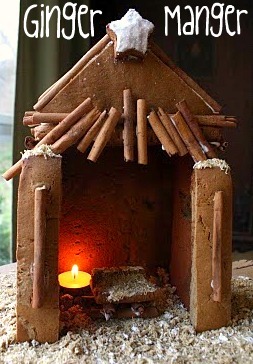 So beautifully done and I love the cinnamon sticks as part of your decorations! Just wonderful! Wow! This is amazing! I love how you used the cinnamon sticks, so clever. And that star on the top is a beautiful detail!! Sue, totally love this ginger manger. It is unique and brings the strong message of christmas! Great work as always! The manger it's so lovely. Thanks for your comment. And I've discovered your blog, I need time to see it, but it looks wonderfull!!! A humble but truly adorable abode :) You used all the decorations to great effect too! This manger is sooo beautiful...love the photos too! What a great idea! I especially like the cinnamon sticks as a decoration. Great job! Creative take on this challenge- Nice work! How cute! You've done a great job. I love the "fire" and bed in there too. What a wonderful twist to the Gingerbread House! I love your creativitiy- perfect. Awesome! That sugar manger is precious..I wish I had that much patience! This is wonderful...I love it! Just featured it on our Fun Finds!